2014: The Great Wrap-up – and Christmas Presents for 2015! 2014: I’ve picked up a bit of the slack and have doubled my infantry battalion count from 2,5 to 5 over the past year, which the army sorely needed! Some more guns were added, but sadly the cavalry was completely neglected. 2015: I’d like to add a sixth battalion to the army as soon as possible, and then it’s on to the cavalry – chiefly cuirassiers, but I’ve also picked up horse artillery and a Chasseurs-à-Cheval unit at Crisis. My mother and my girlfriend also conspired to give me Napoleon’s Berlin carriage and Baron Larrey and his ambulance for Christmas. Both are fantastic models and I can’t wait to get started on them. 2014: Not too many were painted this year, especially after the summer. Chief among my exploits were the jomsviking mercenaries, and that Jarl Rognvald fellow who was completed just in the nick of time. 2015: They’ll probably continue to be on the backburner in 2015. I purchased a couple of the new Shieldwall vikings which will be handled in between other projects. 2014: I put a fairly heavy focus on these guys this year, didn’t I? I’d consider the army mostly done at this point, with about sixty spearmen, 24 bowmen, 12 crossbowmen and 12 cavalry. It certainly is playable in Sword&Spear, Saga etc. 2015: I’d like to add some more pilgrims and/or clergymen to the army, and maybe some more cavalry as well. It likely won’t be happening soon, though! 2014: I completed most of the army this year, but then I decided to go ahead and buy more at Crisis. Idiot! 2015: These new purchases should be dealt with soon enough – a unit of light cavalry, a warlord on horse and a small (literally) unit of Foundry cataphracts. My girlfriend also gave me a pack of Druids for Christmas, which is superb as I was lacking in the command model department. 2014: Both my Fallschirmjäger and British Airborne had their basic forces completed early in the year – it’s a shame I didn’t get more Bolt Action games in, but the game is gaining ground. I really love painting up those camouflages, so more’s on the way! 2015: I’ve purchased additional models for both armies, and I can’t wait to go to town on them! The krauts are getting a Hanomag with a PaK 36 my mother bought me for Christmas (she’s nice like that). The Airborne are getting a bit more love, with two jeeps, a 17-pdr AT gun, a plastic Sherman and… a Welbike-mounted section! 2014: I’ve been rather unkind to this army, and I’ve only managed to paint up a firelock storming party. Shame! 2014: Speed-painting 40 Zouaves in four days was ridiculous; I’ve also painted up half a unit of cavalry and half a regular infantry regiment. Not quite playable yet, but we’re getting there! 2015: What I’d like to do ASAP is to paint the two other halves of said regiments. I’ve got plenty of infantry left after that, and I’ve also picked up a box of plastic Perry artillery which I can’t wait to open up. Still, interest in the conflict has died down a bit in my club, so I’ll take things slow. 2015: I’ve still got eight cavalry lying around… Maybe it’s time to give them some love? 2014: Eight gladiators done, which is the bare minimum to play with. 2015: I hear rumours of other people in the club expressing an interest in the game, so I’ll paint up the models I have left for variety and see where it goes. I’m not ruling out additional purchases for this game, as it’s very cheap. 2014: Just a colour scheme test, nothing more! Although it still amounts to a single completed unit. 2015: I’ll be focusing heavily on this army in the new year – almost all of it is second-hand so it’s been an ideal way to get a new project started up. I’ve managed to find a striking colour scheme without having to invest oodles of time into layering, so you’ll see some results quickly! 2014: Just the one armoured hoplite regiment done – which I haven’t even shown you due to it still needing to be based. 2015: I really need to get going on this army, but I’m considering selling them off as I just don’t have the time for them. But who knows? Maybe I’ll suddenly be inspired to continue working on them. 2014: one regiment of foot and one regiment of horse done, and I really like the scale for how different your approach to painting has to be. 2015: I’ve acquired a batch of infantry, horse and artillery and I’ll be painting these up in between other stuff. The scale isn’t very popular in our club, apart from one guy who has a massive 6mm WSS army already… Small engagements first! 2014: Just sixteen foot knights were painted up this year. 2015: I still have half a box of Fireforge knights and a full box of mounted sergeants lying about… as well as more foot sergeants, more foot knights… But with all the crusader craze I’ll get to them eventually! 2014: many, many crusaders for Kurt, some WSS for Alex, and some Prussians for Henk. All in all I think I’ve painted over 200 models for other people, which is a bit on the high side. 2015: More Prussians – I’ll be doing quite a bit more infantry. Also Kurt has provided me with a small bag of Hashashin for use in Saga, and I’ll be doing these up soonish. Should be fun with all the robes! I know I said exactly the same last year, but I’ll try and keep 2015 light on new commissions – there’s just so much of my own stuff to be done! 2014: Just two guys done. 2015: Finding a decent ruleset for cowboy skirmishes is a top priority for the new year, preferably as cheap and as simple as possible. I’m open for suggestions! That’s the number of models I’ve painted in 2014. Slightly higher than my goal of 600, so what I’m going to do is I’ll start counting for 2015 from 216 on, and set a goal for 600 models again. Before you cry havoc – I’ll be moving house sometime next year which will impinge drastically on my painting time, so I’ll be hard pressed to get to 600! That’s it for the wrap-up, folks. I’ll be posting a few small updates before new year, but the coming days will be busy with work, a surprise weekend trip to Waterloo (courtesy of my fantastic in-laws) and luxurious, decadent, gluttonous feasting. Let me wish you readers all the best for 2015, and I’ll try to keep the blog as entertaining as possible. Arrividerci! Salute 2014 has come and gone, and with that some more Japs have made it onto my painting table. These are reinforcements for Henk’s Ronin warband; he’s got more than enough models to play that skirmish game, but his forces were lacking a bit of variety. All models by Perry Miniatures. First up we have these three mounted chaps. I used my new Army Painter sprays on the horses – fur brown for these three – and I’m pleased with how they came out. I washed them with agrax earthshade straight away and then highlighted them back with deathclaw brown, and voilà! Three of the yari-wielding samurai. 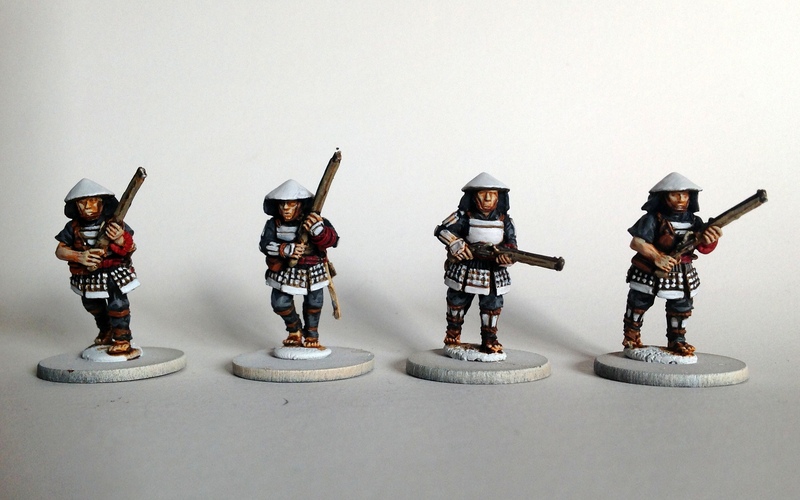 As you can see I worked within the palette used on the ashigaru, but made variations upon it – these are samurai and so should not be uniformly clothed and armoured! The weird angle was a byproduct of the models being removed from their temporary bases too soon. Damn! While I was keen to get painting on these lads, I quickly found out I hate them. Don’t get me wrong, the models themselves are fantastic – you’ll never hear me speak ill of Perry products! – but I believe the molds for many of the sculpts in this range are a bit worn out. The detail isn’t all that clear anymore, which is especially visible on the models’ hands and armour. Consequently, painting these wasn’t very enjoyable, and I just hope Henk won’t be let down by the paintjobs. Still, that’s another clump of models done. 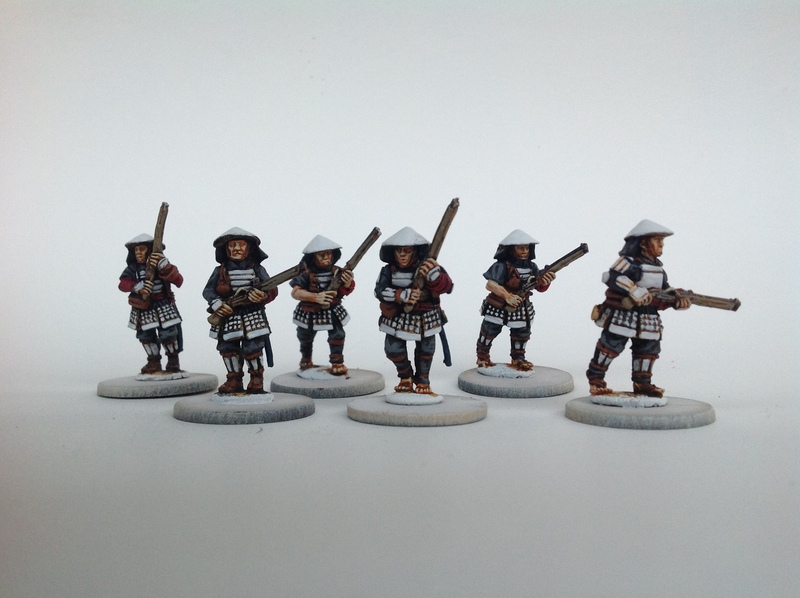 I have six more Samurai that I’ll be doing up soonish, basically the same infantry you see above but with their yari swapped out for naginata (plural? domo arigato, mister roboto?). Other than that, I’ve some Ronin stuff that still needs finishing for my own warband, so I’d best get to work on those as well. You’ll be getting one more update from me tomorrow, which will also feature a small report on my first Napoleonic game which I’ll be playing this evening. Wish me luck! Been a while since I last updated the blog – lots has been happening and I’ve been struggling to find the time to photograph models. I’ve painted up a goodly 63 models since the end of November so I guess this has been my most productive month to date – but much of these models have been commission pieces and have already been handed over to their respective owners. 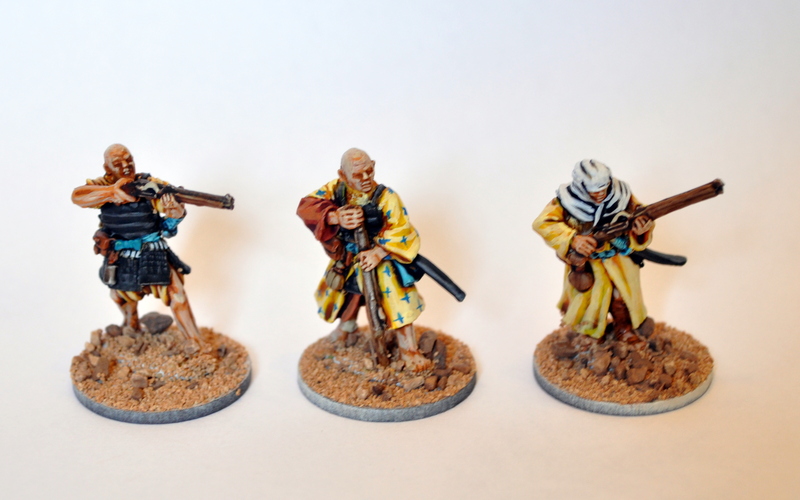 Models for Ronin featured heavily among them – and I’ve found time to start work on my own warband. These six monks with teppo are the first to receive a paintjob; I have six more with naginata ready to receive their undercoat. Fine models, these. I chose to start off with a white undercoat, after which the skin colours were basecoated deathclaw brown. A sepia wash was then applied to the entire model. The robes I washed again with casandora yellow and then highlighted up, first with yriel yellow and finally with dorn yellow (edge paint). I still struggle immensely with yellow, and a trained eye will see some flaws on these models. Six teppo are a little overkill for Ronin, but that’s how they’re packaged! Apart from this, the rest of the techniques and processes used were standard fare. I did freehand a bit, as you can see in the first picture (the right model’s trousers) and the second (middle model’s robes). 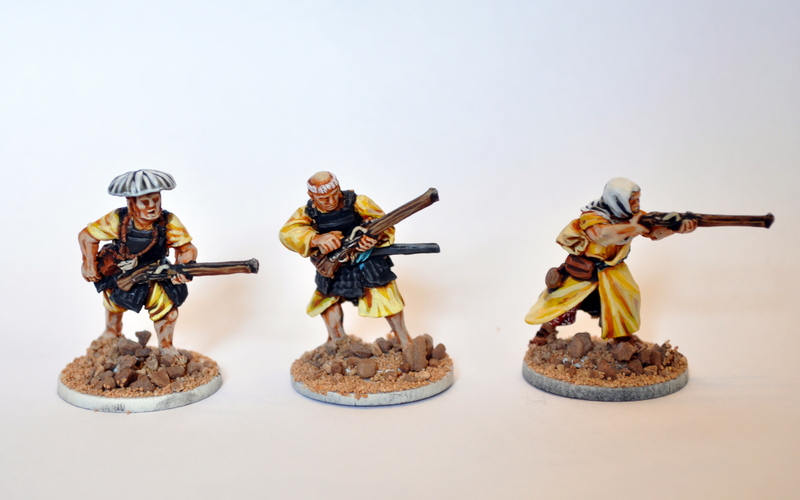 I might put a little more work into them, but I’ll paint up the other monks first and then see what’s adequate. Their bases will also be finished in one go. That’s it for now, folks! I’ll try and get some more photographs of recent work, but with all the family stuff coming up around Christmas and New Year that could prove tricky. 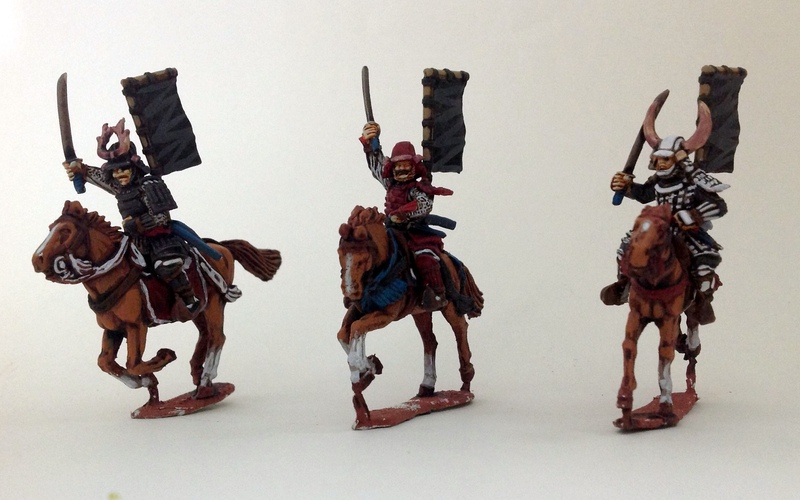 In any case, there are more Sarmatians and a scenery project inbound. Until then, and season’s greetings! Finally, some time to post a blog update! I’ve had a rough week with the passing away of a loved one, some minor health issues and the like, but I did manage to finish the last of the ashigaru. 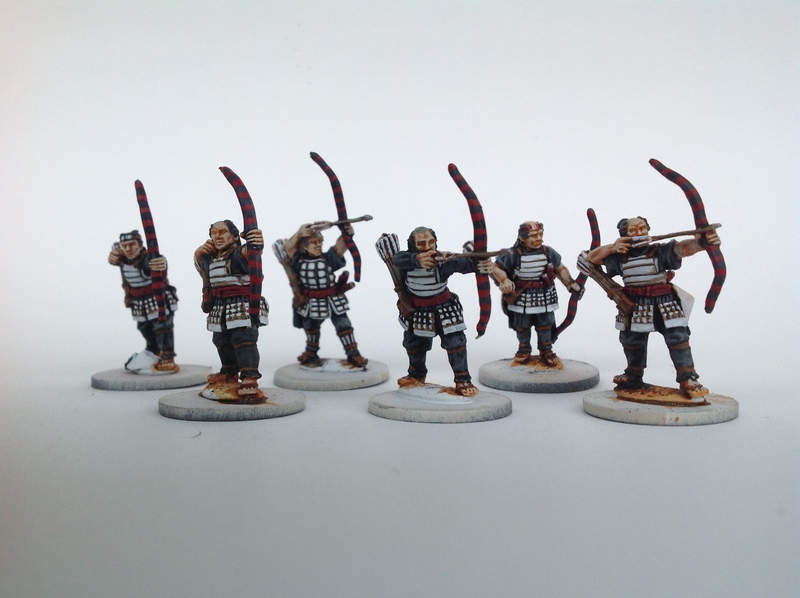 Six yari-armed ashigaru. All models by Perry Miniatures. There’s not a single Perry model I could criticise negatively, and these are no different. Clear casts, little cleaning up to do, and concise detail. On these models I particularly like the variety of poses and armour versions. Always well-researched! I’ve explained the paintjob to you readers in an earlier blog post already, so I hope you don’t mind if I don’t explain it all again. Highlighting the armour was time consuming, but otherwise it was a breeze getting these ready for action. I’m particularly pleased with the bows – they fit perfectly within the colour scheme as well. So there you go, that’s the ashigaru done. Next up for this commission is a pack of six katana-wielding samurai, one of which will be painted up as a leader for the warband. 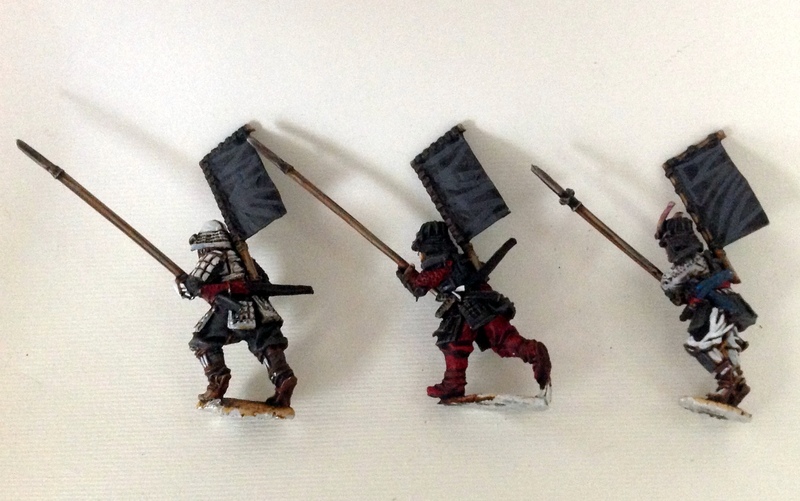 After that there might be more samurai, both foot and mounted, but these will have to wait until after Salute 2014. In the meantime, I’ll have to get my twelve sohei done, too! Next up: more Red Devils. Keep your eyes peeled for them, gents and ladies! Yet again this blog has undergone a hiatus of inactivity. Too bad! The reasons were many, but chiefly it’s down to my girlfriend’s excellent digital reflex camera having some less-than-excellent issues. The lens somehow refused to focus which made the camera itself refuse to actually take pictures, all of which means it’s now off to Nikon for repairs and should be back in about three weeks. Oh well! In the meantime I’ll be using my mother’s iPad again, and as I’ve been using Picasa to some effect, the pictures are actually turning out okay. I’ve got a long weekend going at the moment, so I’ve finally got some time to take pictures in daylight – I never imagined the shortening days having such a detrimental effect on my blog output! Nevertheless, my brushwork hasn’t stopped in the meantime, so you’ll get a smattering of updates today and tomorrow. Unfortunately, I didn’t have the opportunity to photograph the last batch of Jomsvikings and the female ranger model I’ve commission painted for my friend Kurt, so the models that will follow here have been painted from Sunday 3rd until Sunday 10th of November. 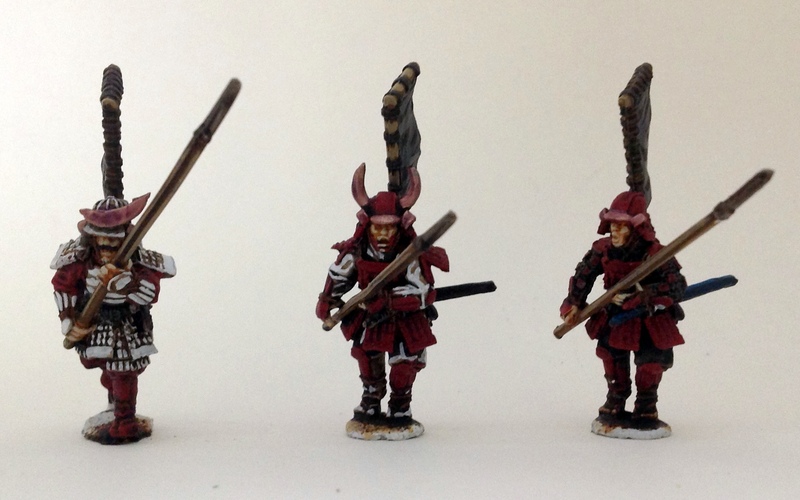 Two teppo- and two yari-armed ashigaru by Perry Miniatures. With the release of the Ronin ruleset by Osprey Publishing, I’ve finally been given an excuse to delve into Sengoku Jidai wargaming and miniatures collecting – and so have others. 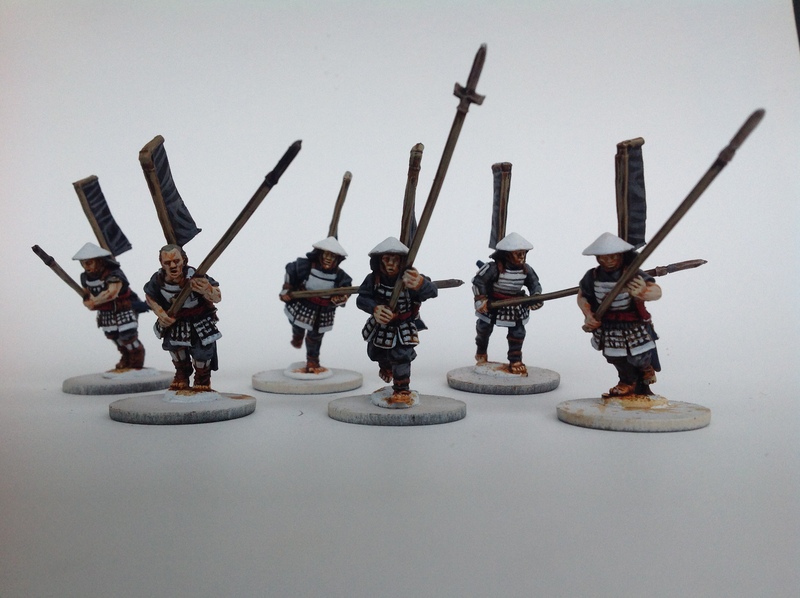 These are commission pieces for my friend Henk, and are basically test models for a rather large warband he’ll end up having when I’m done – eighteen ashigaru and then some foot and mounted samurai. I guess he’ll have a great choice of models when picking his Ronin warband. 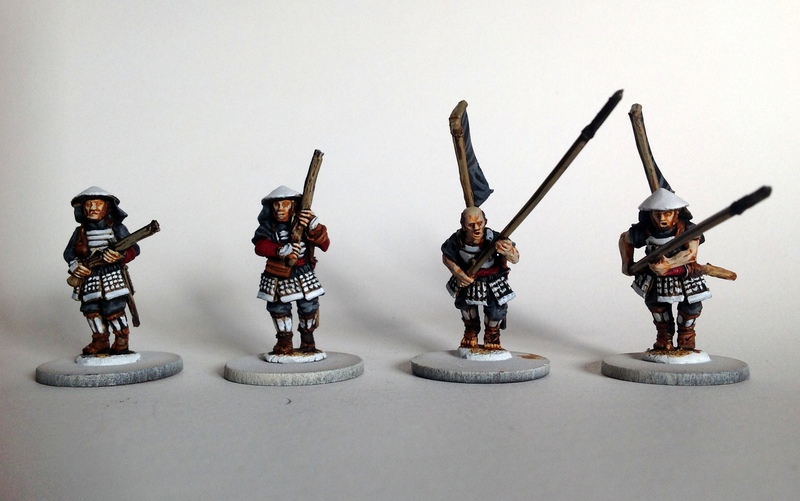 Four more ashigaru with teppo. As with many test models, I undercoated these white and washed with seraphim sepia all over them, although a small exception was to first basecoat the skin with tau ochre before applying the wash. The cloth areas were then basecoated adeptus battlegrey before a nuln oil wash was applied to the entire model bar the skin. Then it was on to highlighting – bleached bone on the skin, ceramite white on the armour, dawnstone on the cloth. Some red was added to the colour scheme as a spot colour in minor areas, and leather, wood and metal were done in my habitual fashion. Voilà! There you go! Part two shall follow hot on the heels of this post!